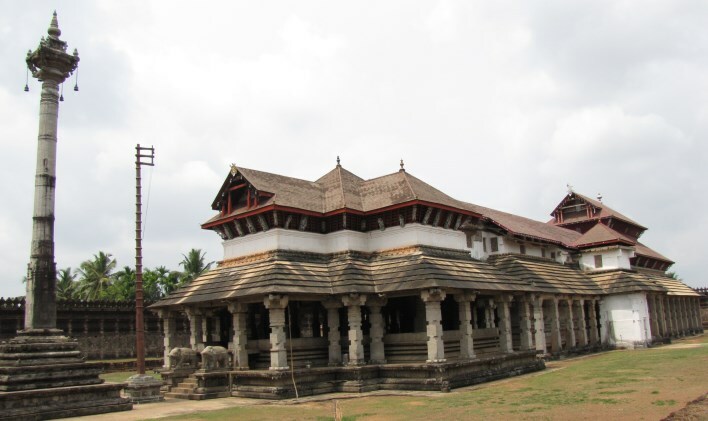 The Thousand Pillars Temple is a Jain temple in Moodbidri that is located in the Dakshina Kannada district. Moddbidri or Moodabidri has 18 Jain temples. The most famous among them is the Thousand Pillars temple. Situated in the center of the town, this temple is also called Saavira Kamabada Basadi and Tribhuvana Tilaka Chudamani Basadi. This temple is dedicated to the 8th Theerthankara Chandranatha. The temple is not under state administration and it is managed by a Jain Mutt. This huge temple was built in 1430 AD. It was built during the Vijayanagara period, so it carries the distinctive marks of Vijayanagara architecture. At the entrance is a huge monolithic pillar called Maanasthamba. There is also a Dhwajasthamba or flag pillar as in Hindu Temples. This temple has a magnificent open pillared hall and the pillars and walls have beautiful carvings. Each pillar carries a different carving. Strangely, there are even figures of giraffes and dragons, perhaps the influence of ties with Africa and China. This temple is inside a fort like structure. The sanctum has 2.5 meter tall idol of Chandranatha. This temple also has jewel encrusted figures of other Jain Thirthankaras. The temple is covered with beautiful sculptures. The subjects are Thirthankaras and episodes from the life of Sri Rama and Sri Krishna. There is a beautiful carving of Sri Rama Pattabhisheka here. There is a Halegannada or Old Kannada inscription inside this temple. The Jain Mutt near the temple has a collection of 12th and 13th century palm leaf manuscripts. Moddbidri is well connected on the road routes. Mangalore is the nearest city and it has an airport and railway station, from where the town can be accessed. Apart from this temple, Moodbidri is now also famous for the annual cultural festival, Alva’s Viraasat. It is a music and dance festival that attracts artists from all parts of India.